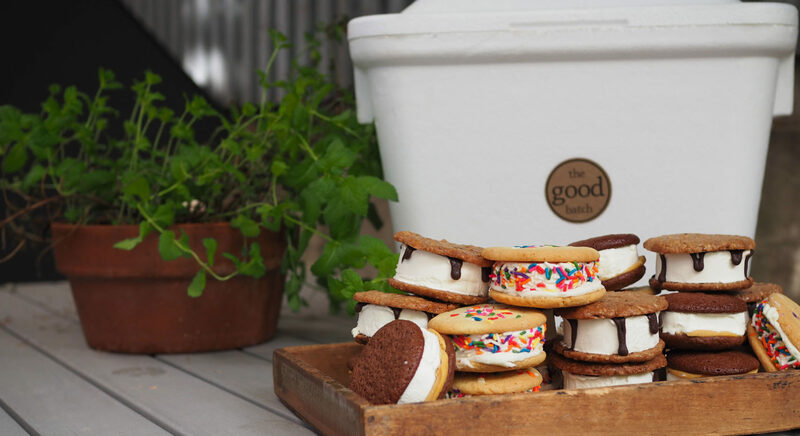 Upgrade any event with a pre-packed cooler of our mini ice cream sandwiches. Ideal for parties at home, in the park, on the beach, or a fun dessert twist to a wedding! Each sandwich is approximately 4 ounces with a 3″ diameter. Keep sandwiches in cool, shaded area for maximum freeze time. For longer storage, sandwiches can be kept in the freezer in an air-tight container or bag for up to one month. Available for IN-STORE PICKUP or MANHATTAN/BROOKLYN DELIVERY ($50 charge). 5-day advance notice required. Changes and cancellations to cake orders are accepted up to 48 hours prior to scheduled pick up time. Please email events@thegoodbatch.com for additional information. Our events coordinator will call within 48 hours of order placement to arrange the delivery. * In the event that any of the flavors are unavailable, a similar substitution will be made. Please enter delivery address, any special instructions, and contact name/number to coordinate delivery.